This is a 5-part series, May 6, 13, 20, 27 and June 3 . A strong health system that supports the uptake of evidence base practices and moves to educate and support health-care providers has the potential to improve the overall health outcomes of populations at risk for chronic diseases and reduce the burden of care. If you as a health-care provider or your organization is looking to improve the use of evidence based practices to prevent and manage chronic disease, the Registered Nurses’ Association of Ontario’s Webinar Learning Series “Back to Basics - Chronic Disease Management” is for you! 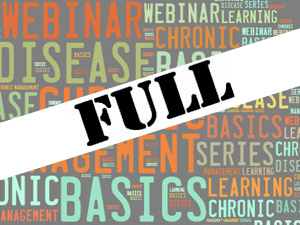 This webinar learning series is presents one learning module a week for 5 consecutive weeks. Each session lasts 2 hours with each module presenting a basic concept, model or theory known to be effective in practice to prevent and manage chronic diseases in clients at risk for the first hour and in the second hour participants are introduced to leaders from various health-care settings who have applied the concept, model or theory in practice. Increasing the communication and enhancing knowledge, about basic evidence based practices associated with chronic disease prevention and management practices. Learning concepts, models and theories that can be applied in clinical settings for the prevention and management of chronic disease. Meeting and hearing from leaders that have applied these concepts, models and theories within their own health-care settings. Networking to discuss the use and effectiveness of evidence based practices to prevent or manage chronic disease. Linking to resources associated with prevention and management of chronic diseases. Logic Model as a framework for program evaluation. Gain perspective and explore the use or application of these evidence-based practices, concepts, models and theories in actual practice settings or specific populations at risk. Gain knowledge about available evidence-based resources from the Registered Nurses’ Association and other health-care agencies to support practices for the prevention or management of clients at risk. Professionals involved in quality improvement and program evaluation. Please note: The dial-in number for each call in the series is toll free.